Families looking for New Jersey colleges should start at the Higher Education Student Assistance Authority (HESAA) website which is actually the student loan authority for the state of New Jersey. The site provides a basic overview of the college application process with links to financial aid programs. The most valuable resources on the website are in the PDF publications you can download. Your best source of information with be the Reach Higher Guide which is a 30 page PDF you can download. The guide contains information that isn’t available on the website such as classes to take in high school and planning timelines. Clicking on the Grants, Scholarships and Undergraduate/Graduate Loans, opens a detailed guide to federal and state financial aid programs. There is a very comprehensive Financial Aid Dictionary and a short one page listing of steps of how to apply for financial aid. Students planning to start out a community college and then transferring to a New Jersey college should visit the NJ Transfer Website. The site includes a list of all participating public and private institutions including 12 private colleges. Users can look up specific courses and see if and how they’ll transfer to another in-state institution. There is also a list of upcoming transfer events. The State of New Jersey Higher Education website allows users to look up programs by institution. It also provides a map of all higher education institutions in New Jersey. You will also find a copy of the Comprehensive State-Wide Transfer Agreement between public community colleges and four-year institutions. The site also has information on state grant programs and the Educational Opportunity Fund. There isn’t any search function but the website does provide several listings of colleges and a link to College Navigator. There are 28 New Jersey colleges with 500 or more full-time undergraduates according to the Integrated Post-secondary Education Data System. Approximately 27 percent of students attend one of the 16 private New Jersey colleges while 73 percent of students attend one of the 12 state institutions. The private New Jersey colleges have an average four-year graduation rate of 43.1% and the public universities have an average five-year graduation rate of 55.6%. 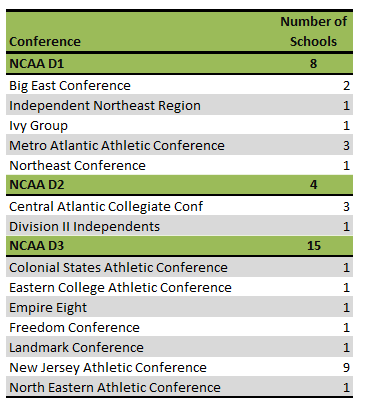 A total of 10 New Jersey colleges meet the DIY College Rankings 50-50 profile requirements. The average SAT score for college-bound seniors in New Jersey was 500 for Critical Reading and 521 for Math. The 75th percentile scores were 580 for Critical Reading and 610 for Math. Nine New Jersey colleges had 75th percentile scores equal to or higher than the state in both categories.